This is the first in what I'm hoping will be a long series of tasting notes based on the home brewed beer that I will be making over the course of the next several years. These notes will attempt to chronicle how my beer tastes following certain number of weeks of bottle conditioning. I also took some video of the pouring and tasting. Be sure to check that out after the jump. History: This beer was brewed on January 10, 2009 and fermented in the primary for 9 days. On January 19, 2009 I racked this beer into a secondary to get the brew off the yeast cake and further clear and finish fermenting. 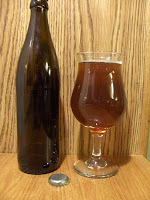 On January 31, 2009 I primed and bottled this beer where it conditioned for two weeks. On February 14, 2009 I took 1 bottle out of the batch and chilled it down for 6 hours then opened it. Alcohol content was estimated at 6.3% ABV. And a low bitterness: 17 IBU. OG: 1.067, FG: 1.020. Appearance: Upon removing the bottle cap I heard a light hiss but not much. So the beer at least had some carbonation. I aggressively poured the beer into a fluted glass with a wide rim to get the most foaming action as possible. The beer was not dark like a normal porter but rather a medium dark copper color. There was very little head action in this glass and the brew only produced a slight 1/2 finger off-white head that quickly disappeared. The beer was remarkably clear with no visible sediment or haze. However, there wasn't much evidence of bubbles coming up from the bottom of the glass. Swirling the glass gave no lacing on the glass. I'm going to have to work on building good head retention on my next batch. Aroma: Here is where things got interesting. What I was hoping to smell was the dark roasted malts that I had put into this beer, but what I got back was a sweet almost Belgian-like aroma. I also detected the slightest aroma like apple cider. Not what I was hoping for. I could smell a lot of malt but nearly none of the hops. I didn't think the recipe had called for that much aroma hops, just 0.5 oz of Goldings with 5 minutes left in the boil. I figure the apple aroma may have come from the cane sugar I used as a primer for carbonation, but it could be something else. Mouthfeel: It was not quite carbonated nearly enough. Just the start. Could use a few more weeks in the bottle. It wasn't really watery as the sweetness seemed to cover the mouth and tongue a bit. I wouldn't call it syrupy but it wasn't crisp either. Taste: It only took me one sip to admit that I had not made a porter but something more along the lines of a Brown Ale or Marzen. The brew was still sweet with just a trace of bitter. It also had a hint of Belgian-like yeastiness to it, not quite a funk but it could be the start of it. I used an English ale yeast but what I was getting back wasn't that at all. I believe I put in a bit too much light malt extract into this beer. The base malt should have been much darker too if I would have really wanted a nice dark porter. Overall impressions: The more I drank this beer, the more it tasted like a Marzen (Oktoberfest). It was easily drinkable without any objections but far from a quality brew that I'm used to. The sample bottle I used was a 0.5L bottle (16oz). I could start feeling the alcohol after the first 8 ounces of the drink. By the end of the bottle I could tell I had drank a 6% ABV brew. I think somehow despite all the yeast I poured into this brew that it could have fermented off more sugar than it did. Perhaps I didn't aerate it quite long enough. I'll double the aeration shaking period next time. While this beer apparently fails as a porter, it passes as a lighter brown ale. I'll let this beer age another couple of weeks before sampling again. It definitely needs more time to carbonate. I don't enjoy under carbonated brew that's for sure. It made me wish for a corny keg and getting some CO2 forced through the beer. As it stands now after 2 weeks in the bottle, I'm only giving this beer a "C" grade. Much to be improved yet. But hey you know, that's homebrewing. Sometimes recipes don't come out like you expected. But with good notes and some further research, I figure my next batch will be even better. I'm not giving up on this batch, oh no. I'm just going to give it a bit more time to mature. - The trials and tribulations of bottling beer. - Brewing my first batch of homebrew for the year. - Creating a yeast starter for my homebrew.